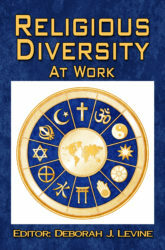 (From Review of Religious Diversity at Work by Dr. George F. Simons at diversophy.com) In addition to her own contributions, Deborah Levine has gathered religious expertise representing various traditions in order to assemble authors for what is a most useful manual for organizations dealing with questions of religious diversity in the US American workplace. Chapters 3 through 6 offer insights to common areas that present workplace challenges in terms of managing religious diversity. People bring their religion to work with them, this often results in a desire to share one’s devotion or one’s practices and values with others in ways that are inappropriate. On the other hand, in a diverse society, religious seasons and holidays, requirements of food and dress and required religious practices may require legitimate accommodations of the workplace schedule, cafeteria diets, meeting space and other protocols. All of these provide challenges to management and colleagues that these chapters are meant to help with, given the complexity of these situations. Further chapters present the beliefs and practices of major religious traditions in significant detail as well as discuss the religiously unaffiliated, always keeping in mind that people differ not only by tradition but by their level of commitment and practice within a tradition, making the management of diversity not only complex, but requiring understanding and attention to individuals’ religious commitment and expression. In addition, one must always keep in mind that there is a legal framework within which one must operate as well. This is facilitated by an appendix of religious discrimination guidelines, as well as several appendices providing additional resources in print and online. NOTE: Each chapter includes a section on Highlights, Discussion Questions, and Discussion Scenarios in addition to content written by experts in the specific field. CHAPTER 1: Why Religious Diversity?